ver the past few years, new procedures were adopted which should assist the Branch Treasurers in submitting collected Clan Society subscriptions/membership dues to Scotland. Dues remain unchanged for 2018 and the new method (**) for submitting the dues was revised. Annual subscriptions, or memberships, are due and payable on January 1 of each year. The Membership Secretary is aware that many of the members in the clan branches choose to pay the dues at the highland games event which they attend during the year. It was decided that a reasonable deadline should be placed on the date which the funds could be accepted in Scotland in order to facilitate a more efficient accounting system. Therefore, while subscriptions are due on January 1, they will be accepted no later than July 31 at the Clan Centre to record membership for the current year. Any funds received after July 31 will be considered membership for the following year. If a member submits the dues after that date, but still wishes to receive a copy of the Clan Annual for the current year, please note that request on the form. It has been requested that at least one submission by each branch be received by the Clan Secretary prior to April in order that the members’ names and addresses can be provided to the Clan Annual printer by the deadline for distribution. At the 2012 AGM, a new form of membership was adopted, the Family Membership. This type of membership includes two people (as an example, husband and wife) who live at the same address. Each person has one vote at the AGM and one Clan Annual will be mailed to the address of record. 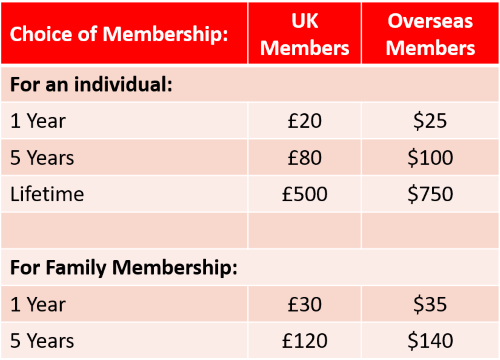 For the one year rate, the first person pays the current rate for membership and the second person pays an additional £10 or $10. A five year rate is also available. See below for the exact figures. Donations to the Clan Centre may be submitted and accepted at any time during the year. For renewing members, please submit a written list which contains the name of the member, the membership number, the amount paid, and any changes to the member’s contact information, including a current email address if you have the member’s permission to disclose it. For new members, please submit a written list which contains the name of the member, the amount paid, address, and email address. For those choosing the Family Membership, please submit a written list which contains both full names, current membership numbers, if applicable, the amount paid, address, email address(s). Forms have been created which should help both the Branch Treasurer and the Membership Secretary in recording the subscriptions and are provided on the following pages. Please take advantage of these forms. It is important to email a copy of your full report to the Secretary at: secretary@clandonnachaidh.net. When the subscriptions have been recorded in Scotland, the Membership Secretary will notify the Branch Treasurer via email that the funds have been received and will include the new membership numbers. As a safeguard, if the Branch Treasurer does not receive an acknowledgement from the Membership Secretary within two weeks of submission, then the Treasurer would be wise to send an email of inquiry to the Membership Secretary. **Recommended method: use the portal, "Branch Membership & Renewal", which can be found on the website under the "Branches" tab, to transfer the collected dues from an established PayPal account for your Branch into the PayPal account for the Clan Society in Scotland. Also be sure to email a copy of your full report to the Secretary. Send the written lists, along with a clan branch credit card authorization to the Membership Secretary. Send the written lists, along with a clan branch cheque/check or certified bank check. If using this method, please remember that the Society must pay extra bank fees, so if possible, include an extra $10. You may choose to fax a subscription to: 01796 483338, or: 011 44 1796 483338 from the U.S., or telephone the Clan Centre with your card information at: 011 44 1796 483338.